Fans mourn Papa Wemba in Kinshasa. Known as the king of Rumba Rock, 66-years-old Congolese singer died on stage while performing in Abidjan, Côte d'Ivoire. He collapsed during the FEMUA urban music festival on Sunday, 24 April 2016. 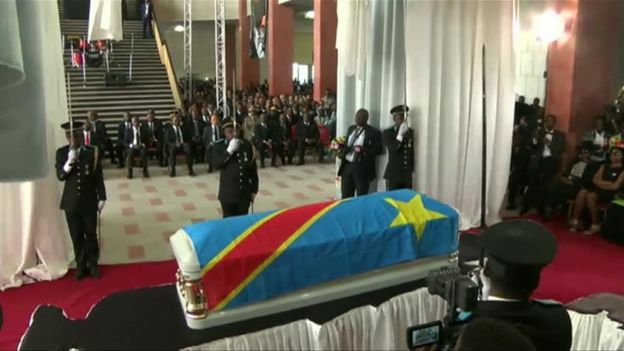 His body is currently in the parliamentary building in Kinshasa and later will be taken to his family and public to view. Whole world mourned for his death. President Joseph Kabila personally arrived in this sad hour to give his respect to the legend. Not only was that but Wemba also awarded with one the DR Congo's highest honors for the "loyal and eminent services given to the nation". Fans from around the nation gathered around to bid this late singer a last farewell. Not only him but chairperson of the African Union Commission Dr.Nkosazana Dlamini-Zuma also expressed her heartfelt condolence for the loss of one of the nation’s pride jewel. The demise of the King of Congolese rumba really left a mark on the African Music history. “He was a reference. In Africa, he modernized our music. If he had not done so then we would be very far away at the back. He was tremendous and a wonderful person who won my respect,” said A’Salfo, Leader of Ivory Coast Magic System. Hailed as one of the most influential musicians of Africa, Papa was respected by many, not only his homeland but the entire globe. His body will be buried Wednesday. This year has shown a loss of some great names in music history. From Prince to Billy Paul and now Papa Wemba. May these soul rest in peace.